•With black border and has a lightproof black back. •25mm black masking borders to enhance picture contrast. •Black backed screen which eliminates light penetration and produces top quality colour reproduction. •Static resistant, fire retardant, mildew resistant. •The screen features a heavy duty, scratch-resistant metal case in black. 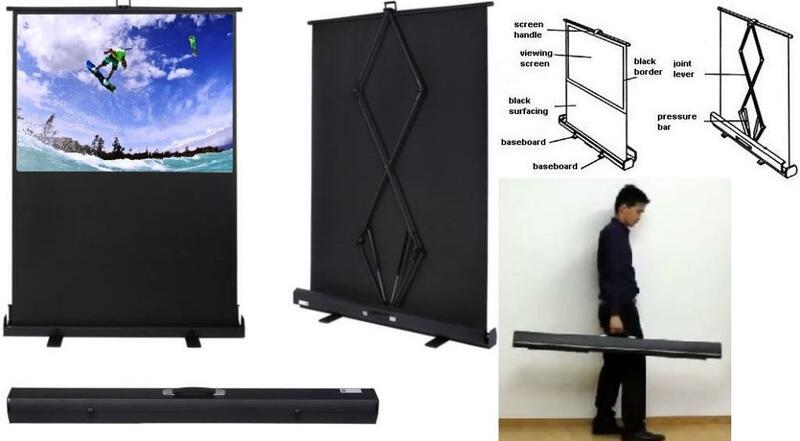 •The screen housing is supported on the ground by two sets of feet providing a very stable screen. •The screen may be collapsed into the housing for safe transportation avoiding many of the problems associated with tripod systems. •Comes with a convenient carry handle.